Executive summary: In considering the launch of Internet Explorer 7 in the context of the Spread Firefox campaign, I ask whether, now that the slumbering juggernaut of Microsoft has awoken and is learning to be more open-source-like, Firefox and open source advocates generally should continue to promote Firefox as a product or instead focus on promoting the movement and ideology of co-production and gift economics that produced Firefox. Well, clearly, after cutting my teeth on Spread Firefox, I couldn’t simply let the release of IE7, the first major browser upgrade from Microsoft in five years go by unnoticed. I mean, it’s a browser release — which on the surface shouldn’t be that interesting. In fact, it’s really not (except that the view-source protocol has been disabled). What is interesting — I suppose — is that this is a moment that many of us have been holding our breaths for. Considering the massive install base, the sheer inertia and lack of incentives to change (if it ain’t broke don’t really apply in this case, however), it’s remarkable that Microsoft did push through this effort as quickly as it did, both directly answering the call of Firefox’s meteoric rise and then upping the ante ever-so-slightly. If I were blunt, I would say that, from a lay-person’s perspective, Firefox is like IE6 with tabs and a search box, a popup blocker and less spyware and is a bit faster. Oh, and has a nice icon. If if Microsoft hadn’t become monopolistically lazy, Firefox would kind of be like the bugfix version that should have followed the subsequent IE6 service pack upgrades… offering a little more speed and functionality, but not messing much with the basic model of the browser. But it wasn’t Microsoft that released Firefox, it was an upstart foundation called Mozilla, charged with promoting choice on the net. And after basking in the limelight for some time, is being shoved sideways by Internet Explorer 7, which incorporates many of the changes that set Firefox apart while improving on some of the additions that Firefox did add first… like RSS subscriptions and tabbed browsing. But IE7 also adds a pretty decent Favorites manager, a Phishing filter, improves its standards support (finally!!) and other incremental things. But more importantly, they actually learned a bit from the open source community and opened up their process by publicly releasing five betas and a release candidate… something Microsoft hasn’t really succeeded at in the past. Y’know, this is important — and not just because Google’s looming over the playing field with Mozilla very near to its cafeteria — oh no… if you read what the marketingspeak they’re announcing this release with, it says “we heard you”. Jim Allchin said something to me rather ominous when I had dinner with him and some other terrific folks back in January. After I’d introduced myself as a Flock employee and an open source ambassador he looked me squarely in the eye and said …even though that might not be as open as you might like, we are learning. Now, while the PR machine may be in full effect here, I do believe that Microsoft did hear us. I believe that the New York Times ad that I designed was the shot heard round the world, with the echoing reverberations resulting in upwards of 10-20% adoption of Firefox. It wasn’t the ad itself or the fact that I designed it that matters (anyone could have designed it — I just happened to be the lucky schmuck spending all night plugged into a PowerMac G5, trying to get Illustrator to cooperate (did you know that one of the core Illustrator engineers actually pitched in to help me to get the ad to render?!). What matters is the fact that we had a community speaking with one voice, in concert: that the starfish could collect itself from its little communes spread across the world and demand something more. And build something better, for itself. Now here’s the problem. That voice — that spoke clearly and spoke loudly — woke the slumbering giant. It was groggy and it was a bit lame having been sound asleep for so long, but once it was fully awake and realized who had woken it up, it went about chasing down the sonovabitch who dared to threaten its slumbering dominance. But when it awoke, it was faced with challenges on all sides: from Google, from Apple, from Firefox, from Sony, Yahoo! and others. It was no longer king on the hill and now that its enemies were becoming evermore decentralized and spread out, it couldn’t just smash them to bits or eat them whole… instead, it had to go quiet and think for a moment… and realize, heck, it could actually compete if it became more like its attackers… more nimble and more decentralized. And that is where we are today — in the middle of an uprising from within — lead by folks like Kim Cameron, Ray Ozzie and others — on the opening lines of Web 2.0. What’s lead us here so far has only been the precursor in what will be a very long and very gradual change in our cultural and technological environment. But the launch of Internet Explorer 7 represents the true beginning of Web 2.0 because the vast majority of folks who have been living on borrowed time, using the spyware prone and popup-riddled previous version of IE, now have a capable browser… one that’s just as fast as what the rest of us are used to, with tabs and support for feed and CSS standards. And it’s delivered automatically, without a thought or a care necessary. So what comes next is where things get interesting. I’ve asked before what Firefox advocates intend to do next… whether they can really hold on to the gains they’ve seen in recent years, or whether they’ll see a slow attrition in their numbers to alternative browsing experiences or even cede back ground to IE. Long ago I proposed a plan for Firefox advocacy that was based more on ideology and less on features. It focused on spreading the open source co-production philosophy beyond the confines of nerdville and academia — the same philosophies and practices that carried the development and creation of Firefox — because it is my contention that open source is a positive force and should spread beyond its traditional software roots. In essence, it needs to become more inclusive, more diverse and generally more representative of the wider community it strives to serve. Otherwise, it will continue struggle to become a viable economic and productive alternative to the existing growth-based model. But the change that’s necessary won’t happen without explicit effort or without constant self-reflection. So here we are now, on the precipice looking out on the mere beginnings of Web 2.0. With Internet Explorer caught up and inching ahead, there is a critical question for Firefox advocates: do we stay the course and continue promoting Firefox as a product competing with Internet Explorer? Or, do we focus on the wider, more gradual fight to spread and improve open source principles and practices — in effect, to “win the hearts and minds” of those who employ us by day but leave us hacking at night, struggling to make a decent living at it should we choose to pursue it as our primary occupation? Personally, I prefer to chase the latter… for, after all, what really comes next, well, shall be determined by our combined intentions being realized. This so acutely expresses the challenge faced for someone like myself who helps shape the use of web technologies for a large community, a beurocracy, an influential learning environment which happens to be a state university. We shouldn’t simply be swayed by technological or beurocratic obstacles, we should be driven by a societal imperative. I didn’t know that you were the “lucky schmuck” who pieced together the NY Times ad, I’d really love to know more about that process if you’ve written about it in more detail somewhere. One of the most effective aspects of that ad was that it gave me an excuse to get people interested by simply letting them know they could find my name in the New York Times. Not a bad way to start a conversation. You almost said it but didn’t quite – IE7 has moved the browser game on beyond Firefox. It’s a really nice program – no tab bar, no tool bar, no menu bar. Instead, a clean-sheet look at how the GUI of a browser should work, maximising screen real-estate. And you know what? It works! That’s something that Apple still needs to learn. They never do public betas or public RCs. That’s why the recently released iTunes 7 is so horribly buggy. Excellebt post sir. It has made me consider the IE7 threat, and it is serious indeed. 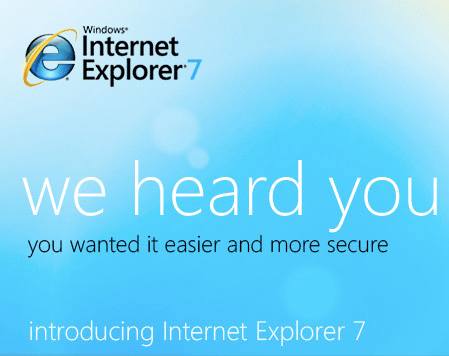 I think IE7 will be more of a catalyst than a threat. The flaws and weaknesses of IE6 spurred the development of FireFox and in many ways the improvements in IE7 will create more drive to improve FireFox. Having at least 2 competitors in the space helps keep everybody on their toes. I personally see this progressing to a point where browsers are competing as much as they are coexisting. For example, I use IE7 at work because the favorites and feeds give me quick access to my work related things. However, I use Flock at home because it provides tools for personal activities like blogging and Flickr. I wouldn’t be surprised if we start to see more specialized browsers emerge over the next few years. One of the most interesting aspects of the IE vs. Firefox battle is the development of the ecosystem of extensions or add-ons. Itâ€™s not just about bugs and features. Right now Firefox had a great advantage in this space but you can see Microsoft trying to catch up. I think the ecosystem for Firefox and IE will decide who wins this battle. What do you think? Damn good post Chris. While I dropped Firefox as my primary broswer (the memory leaks were driving me around the bend) when beta 2 of IE7 came out, I’ve kept it around for testing. Regardless, this is the beginning of something new. When IE7 is force-pushed to all users, well that’s going to change browsing habits tremendously. Firefox is going to have make a compelling case beyond “we’re not Microsoft” to sustain itself. I don’t think philosophy is going to do it. I think it is going to have to be features based. Considering IE 7 does not run under Mac, I do have to wonder how much you have actually used it — even with your wonderful Parallels. I know that is not the point, but people may get distracted by your claim that it is just as fast or inching ahead. But people that is definitely not the point. If it is not as fast today, it will likely be tomorrow. I celebrate thinking small, but ideology won’t win most of the consumers of Firefox, the product will. There is great irony though, by creating a diverse community with strong leadership with one voice — sure, it will take a lot of time — Firefox will not only continue to lead in technology, but could also in user base (and profitability). Having lots of public betas is not new in MS land. It begun with VS 2005 CTPs, and all DEV related products follow this approach nowadays. What’s new might be releasing a mainstream product in increments which can also be used by moms and grandmas. Your article is not very good. For a start, Microsoft has _not_ embraced the OSS community model remotely. You state that by releasing one RC and a few betas, this counts as ‘open source’ involvement?! Are you nuts? FOSS is not about releasing beta’s (something which, I might add, MS has a CLEAR history of doing previously, IE5 had many betas for instance) but about an ideology. Microsoft’s ideology couldn’t be any further from FOSS’ ! Your article is written from the typical, idiot, perspective of an MS fan-boy – meeting Alchin for lunch indeed, pff !! Have some self-resepect. Noticing how you see some importance in “some of the additions that Firefox did add first… like RSS subscriptions and tabbed browsing”, I’d like to remind you that Opera has always a been a step ahead in introducing new features. Shrug… It’s still just a browser. And, frankly, the first from Microsoft that didn’t directly steal it’s look and feel from Windows 95-era Netscape. Wake me when there’s real innovation here. IE7 has made switch to Firefox..
of the screen as the back and forward buttons.. uggh..
you really dig ie7 as a better future for the web?? people! the web is not the navigator, it’s inside the navigator. what bring firefox/safari/opera is not only a decent software but tools for designer to create better website. it is a lot of important than an other ui-breakdown to windows than ie7. Good article. I would lhave liked to see more information on the specific features of IE compared to Firefox. Also, I would’ve liked to see more information on some of the problems still being worked on my Microsoft. Other than that, it was very clearly written and had some good points. Pingback: roots.lab » October 2006 — "the true beginning of web2.0"
Great post Chris. You will always be my favorite liberal! Seriously miss the times when we where pulling off the New York Times success. Congrats on the relationship you make an attractive couple. Drop me a line. Like you Chris, I own a PowerMac G5, so even if IE7 boasts new features I’ll never experience them as they ceased support for Mac OS X (though I have used Beta to test some layouts). I actually wrote an article on my own blog about how Microsoft is making a huge mistake by not supporting or rather ignoring other platforms. I’m not a Firefox fanboi or anything, I think the browser has a lot of problems but IE has more. I have to say I personally alternate between Firfox 2 and OmniWeb. Firefox sometimes runs a little slow cause it’s a RAM hog so I have to switch browsers. As with Mozilla Songbird versus Apple iTunes, I think some people may choose to use browsers like IE7 or Safari cause the interfaces look nicer and because they don’t need or are not interested in all the plugins that Firefox offers like the Web Developer Toolbar or the User Agent Switcher to name a couple.